National Language English, Welsh, Irish Gaelic, Scottish Gaelic. 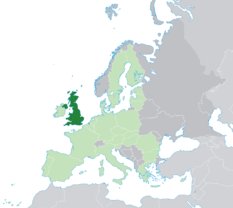 The United Kingdom of Great Britain and Northern Ireland (which is usually shortened to just the UK or United Kingdom) is a political union made of up of four countries, England, Scotland, Wales and Northern Ireland. England, Scotland and Wales share the island of Great Britain, which lies just off the northwest coast of continental Europe. The fourth country, Northern Ireland, is a portion of another island, which is split between Northern Ireland and the Republic of Ireland, an independent country, in the south. The UK also has overseas territories such as Bermuda and Gibraltar. The union of Great Britain and Northern Island is the latest that has occurred over the last 300 years. Originally Scotland and England were two entirely separate countries with their own monarchs and political systems, and Wales fell under the control of England and was known as a principality. Over the years, various acts of union have taken place that have brought England, Scotland, Wales and Ireland together, and Ireland was later to gain independence in 1922 leaving the current split we see today. The British Empire was once a world force, with territory as far flung as India, Canada, South America and Africa. Although colonial days are far gone and there has been a steady decline in the British Empire and the UK's influence around the world, the UK is still a major political and economic force, with membership in the G8 and an economy that is the fifth largest in the world and second largest in Europe. The UK’s colonial history also means that it has been subject to a multitude of international influences and influxes of people, helping to create the multi-cultural society that exists today. Presence of World’s most fascinating city such as London which is considerable the most preferred as well as renowned city encompassed with world famous universities and colleges. Home to one of the largest student population of any city in the world, London houses many different universities, colleges and institutes. Not only that, but London is a global leading business, financial and cultural centres. With a rich history, so many places to see and things to do, London offers everything a student need. Join the exciting student population in one of the greatest cities of the world- London. London’s student population is over 350,000. With so many students around (a lot of them being foreign students), you’ll feel right at home. Almost half of those students study at one of the 20 Colleges and other smaller institutes of the University of London, the largest contact teaching university in Europe. Some of its institutes include Imperial College London and University College London, which are among the top 10 universities in the world and are great institutes of research. Others include London School of Economics and the Royal Academy of Music.